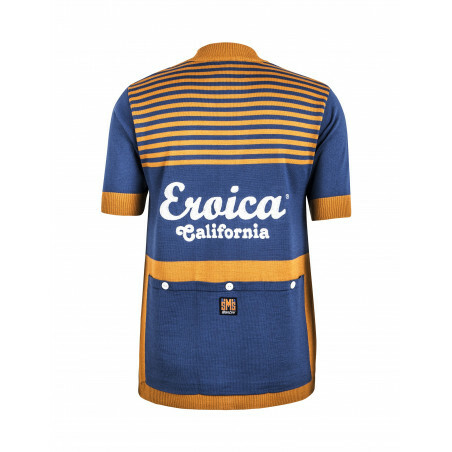 Eroica California wool jersey with embroidery front and back, metal zipper and pearl buttons on the back pocket. The soothing sounds of crashing waves, the blue of the ocean and the warm sandy shades of Californian beaches - these were the images and colours that inspired the design of the Eroica California jersey. The jersey is made of wool and beautifully embroidered with the original "LEroica" logo both front and back, and finished with some authentic details such as mother-of-pearl buttons on the back pockets and metal zip on the front. 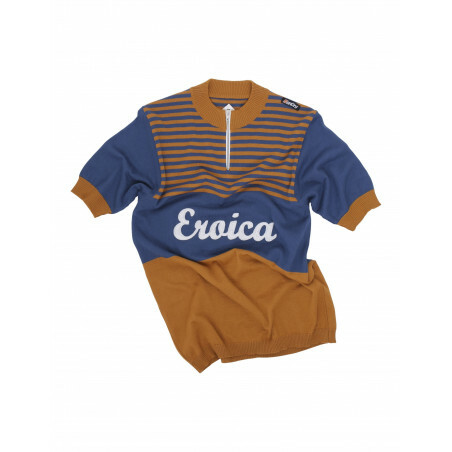 The "Eroica Approved" label inside the collar ensures the garments originality and its approval in every race of the Eroica series. Apart from originality and retro look, it transpires quality!